1st prize shearling ewe from Halfpenny Flock. Best Group from the Shamrock Flock. All the 1st prize winners. 1st prize ram lamb from Shamrock. 1st prize ewe lamb from Shamrock. Reserve Champion, shearling ewe from the Foulrice Flock of Charles Marwood. 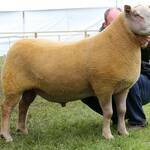 Champion Senior Ram, Gyffin Knockout from Mr Percy Tait. The breed judge, Mr David Mawhinney from Northern Ireland studies the three 1st prize male winners. From left to right shearling ram Logie Durno Kingmaker, ram lamb from the Halfpenny Flock, 11YUU 0071 a son of the champion and Springfield Inxs the eventual winner. Also from the Linton Springs flock, the reserve female champion the senior ewe (XUJ 9136). 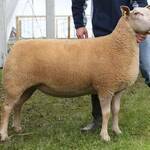 Terminal Sire Interbreed Male Champion and Charollais Breed Champion, Springfield Inxs (ZGB 8007) from Stephen and Nicol Hodgson’s Halfpenny Flock. Reserve Male Champion, shearling ram Logie Durno Kingmaker (ZNN 0053) from Robert and Samuel Tindall’s Linton Springs flock. The final line-up in the group class; 1st Linton Springs and 2nd Sulwood flock. Champion and reserve in the shearling class. Robert Gregory checks the shearling ewes. Reserve Overall Champion, shearling ewe from the Loanhead Flock. Reserve Male Champion, shearling ram from the Leelaw Flock. Male Champion and Interbreed Pairs Champion from the Logie Durno Flock. Champion and Interbreed Pairs winner, shearling ewe from the Loanhead Flock. Reserve male champion, Castellau Lord Mayor owned and exhibited by Jonathan Aiken, Carnew Flock. Reserve female champion, shearling ewe from the Parkgate flock of Alan & Herbie Kennedy. Reserve and Male Champion, Arjane Klansman also from the Logie Durno flock. Breed Champion, two shear ewe from the Logie Durno flock. 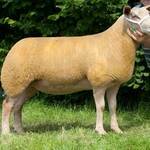 She was sired by Rockvilla Golden Promise out of a Rutland ewe. 1st prize ram lamb from Arwyn Thomas’s Arbryn Flock. 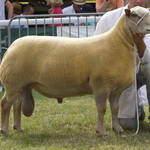 1st prize senior ram, Kingsland from Percy Tait’s Knighton flock. 1st prize ewe from the Dalby Flock of Charles Sercombe. Male Champion, Elmwick Mr McGregor from Jennifer Curtis, Worcs. Reserve breed champion, ewe lamb from Ifan Hughes, Eithinog Flock. 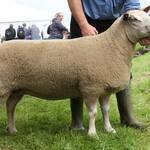 Champion of Champions Royal Welsh 2013, shearling ewe from the Loanhead Flock of Gregor and Bruce Ingram. The Champion of Champions at the Royal Welsh Show, Logie Durno Kate a two-shear ewe from the Ingram’s flock. The Interbreed Champion Pairs – LD Kate with Frwyd Lord of the Ring. 1st prize ewe lamb also from the Castellau flock of Tim Prichard. 1st prize ram lamb from the Castellau flock of Tim Prichard. This lamb was reserve supreme ram lamb. Reserve Champion, shearling ewe from the Glyn Coch flock of Adrian Davies. Reserve Male Champion, senior ram Logie Durno Kracked It, exhibited by Tim Prichard and Justin Evans. Interbreed Winning Group of Three, from the Logie Durno Flock of W & C Ingram. The Interbreed Group of Three winners, from the Castellau Flock of Tim Prichard, Glamorgan. Included the ram lamb (11TZ 00252, 3rd prize ewe lamb (11TZ00290) and 2nd prize shearling ewe, (TZ 0015). The winning interbreed pair together with the judge Mr Lionel Organ and his wife Jenny. Charles Sercombe (right) with his ewe and Tim Prichard with his ram lamb. Reserve Overall Champion 2011, Male Champion and part of the Interbreed Pairs winning duo, ram lamb Castellau Lord of the Manor (11TZ00252) from Tim Prichard’s flock in Glamorganshire. The lamb was sired by the first prize shearling ram, Logie Durno Knockout. Jennifer Curtis receives the award for the Interbreed Continental sheep, with her ewe Elmwick Isabel. Reserve Male Champion, Elmwick Landscape (11DQ00297) ram lamb from Jennifer Curtis. Reserve Female Champion, the two-shear ewe Dalby Jessica (PE9137) also part of the winning Interbreed Pairs. From Charles Sercombe’s flock near Melton Mowbray, Leics. Royal Welsh Champion 2011, Elmwick Isabel (DQ 8020) from Mrs Jennifer Curtis, Wickhamford, Worcs. Isabel went on to take the Reserve Supreme title. RESERVE BREED CHAMPION & INTERBREED PAIRS CHAMPION – Peter Vaughan’s Senior Ram – 12WNC00403, Loanhead Monarch of the Glen. BREED CHAMPION, INTERBREED RESERVE CHAMPION & INTERBREED PAIRS CHAMPION- Peter Vaughan’s Shearling Ewe 13WAA01170. This ewe will be sold at the Kings Land Dispersal Sale on Saturday 28th June at Worcester Market. Interbreed pairs winners, Jennifer Curtis with Elmwick Mr McGregor, the judge Mr Tim Prichard and Carol Watson with Sulwood Ladybird. Best progeny group from the Elmwick flock. 1st prize ewe lamb from the Elmwick Flock of Jennifer Curtis. Reserve Champion, senior ewe from the Foxhill Flock of Mike and Melanie Alford, Devon. Three Counties Breed Champion 2011, shearling ewe from Mrs Jennifer Curtis’s Elmwick Flock. The ewe went on to take the reserve interbreed title. Three Counties Reserve Breed Champion 2011, ewe from Mr D Jones. Balmoral Interbreed Champion, shearling ewe from Artnagullion Flock. Judge Adrian Davies surveys the shearling ram class. 1st prize ewe lamb from William McAllister’s Artnagullion flock. 1st prize ram lamb also from theArtnagullion flock. 1st prize senior ewe from Mrs Diane Christie. Balmoral Interbreed Champion 2011 from Mrs Diane Christie, purchased at the Dungannon sale from Craig Brother’s Ballynoe House flock for 800 gns. 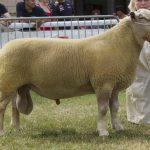 Left – Male Champion was the 1st prize shearling ram, Garriston Knockout from Mrs Diane Christie. 1st prize senior ram from David & Liz Mawhinney’s Rockvilla flock. Balmoral Reserve Breed Champion 2011 ewe lamb from Norman McMordie’s Riverdale flock. 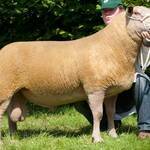 John Eveson’s Charollais Champion and Interbreed Champion at Denbigh and Flint Show. Dumfries Show, Interbreed Champion from Alan and Herbie Kennedy’s Parkgate Flock. Echt Show – Interbreed Champion, shearling ewe from Eilidh and Erin Duncan’s Braemuir Flock. 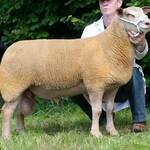 Turrif Show – Interbreed Champion two-crop ewe from the Ingram’s Logie Durno Flock. Staffordshire Show, Robert Gregory, Edstaston Flock – Interbreed Champion Group. Staffordshire Show – Interbreed winner Edstaston Madison from Robert Gregory. Bath and West Show – Jennifer Curtis’s shearling ewe. Bath and West Interbreed Champion, Carol Irwin’s shearling ram. 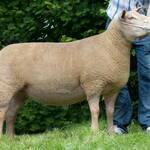 Stranraer Show – Interbreed winner, Carnew shearling ewe from W. Kennedy, Lyonpark Flock. Cheshire Show – Interbreed Group of Three from the Rainbow Flock. Devon County Show Interbreed Champion, shearling ram from the Gogwell Flock of Robert Hopper. 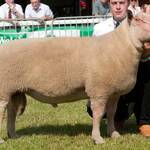 Cornwall Show – Reserve Interbreed from Robert Hopper. Stafford County Show – Interbreed Group of Three from Robert Gregory’s Edstaston Flock. Rutland County Show – Interbreed Group of Three from Charles Sercombe’s Dalby Flock. 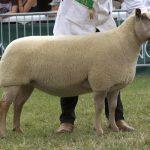 Rutland County Show – Interbreed winner, ewe Sulwood Ladybird from Geoff and Carol Watson. 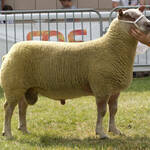 North Yorkshire Show – Interbreed winner, shearling ewe from Stephen Hodgson’s Halfpenny Flock. Royal Cornwall show never got to the interbreed stage as the sheep had to leave the showground due to high winds and pouring ram – their marquee collapsed! 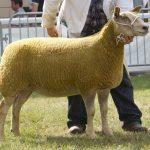 Winner of the Charollais classes was Robert Hopper’s shearling ewe. Mike & Melanie Alford’s senior ewe from their Foxhill Flock took the supreme title at Bath & West Show. 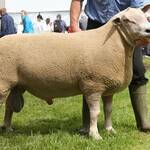 Interbreed champion at Lesmahagow Show was Alan & Herbie Kennedy’s ewe from their Parkgate Flock. Charles Sercombe started off the season with a double interbreed victory at Newark Show. 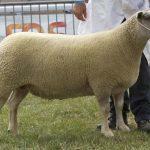 His two-year old ewe, owned by the Micklehills flock was sired by Rockvilla Father Ted out of Rutland Lightening, who was interbreed champion at Leicester County Show. She took the individual interbreed title and then teamed up with Dalby Kracked-it and a shearling ewe to win the interbreed group of three. The breed had a great day at Armagh, taking all three of the Interbreed classes. Diane Christie’s shearling ewe took the individual title, a group of three from the Carnew flock of Jonathan Aiken and they also won the pairs class. The Elmwick Flock of Jennifer and Geoff Curtis from near Evesham took both the individual and group interbreed titles at the Burwarton Show.